Sambar is a popular South Indian vegetarian gravy based dish that’s served along with dosa, idli, rice etc. 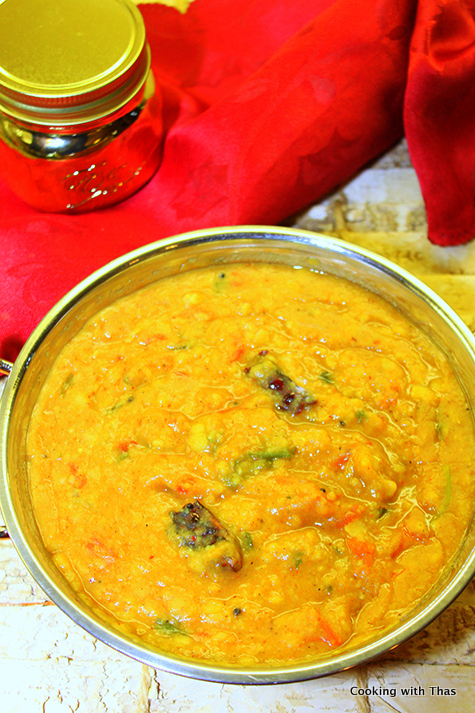 The authentic sambar is made with mixed veggies and toor or tuvar dal. There are literally n number of variations for making sambar. Grated coconut is roasted along with whole spices and made into a paste and added to the gravy- this is Chettinad style sambar, very flavorful sambar. In other kinds, mixed veggies are cooked with toor dal and then sambar masala is added along with tamarind extract. Even the kind of veggies used can vary from region to region. This time, I made sambar with tomatoes as I had an abundance of tomatoes; harvested a lot of tomatoes from my veggie garden. I cannot put into words the joy I have when I cook with the veggies freshly picked from my garden. I made the homemade sambar masala as well- roasted the whole spices and ground to fine powder. This masala is packed with flavors and made the sambar taste extremely delicious. The best part is homemade sambar masala can be stored in an air tight container for a few months. So guys, give this recipe a try and this will turn into your favorite sambar recipe. Firstly, let's make the homemade sambar masala. Place a pan over medium heat, let it turn hot. Add chana dal first and saute for a minute. Add coriander seeds, cumin seeds, whole peppercorns and dried red chilies. Roast till aromatic and seeds turn light brown. Be careful not to burn the whole spices. Keep aside the pan and let cool down. Add the roasted spices to a blender or spice grinder and grind to a powder. Keep aside. This masala can be stored in an air tight container for a few months. This recipe will yield 4 tbsp. First, soak golf ball size or 2 inches fresh tamarind in ¼ cup lukewarm water. Soak for 5 minutes. After 5 minutes, squeeze the tamarind in water to extract the juice. Strain the juice and discard the skin. Keep aside. Rinse the toor dal taken in a strainer. Turn on the Instant Pot- I used Ultra model IP. If you don't have an IP- cook the toor dal in a pressure cooker till 2 whistles. 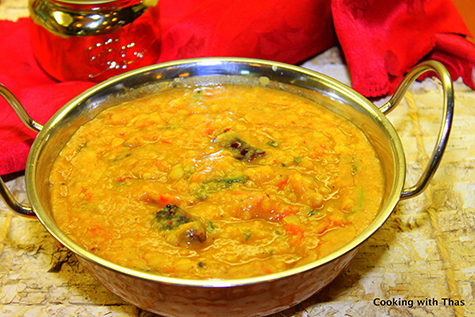 Add toor dal and 1½ cups water to the stainless steel pot. Close with the lid. Select Pressure mode- high pressure, set time to 3 minutes. After 3 minutes, do a quick pressure release. It only takes 3 minutes to cook toor dal in the IP. Cancel pressure mode and select saute mode- normal temperature. Add turmeric powder and chopped tomatoes to the cooked toor dal. Combine well. Let cook for a few minutes till tomatoes are cooked. Add the prepared sambar masala- 2 tbsp, combine well. Cook for a minute. Add tamarind juice, combine well and cook for a minute. Add cilantro, cook for a minute. Remove the stainless steel pot from the main pot. Keep aside. Add oil, let oil turn really hot. Add dried red chilies and curry leaves. Saute for a few seconds. Pour the tempering over the cooked sambar. Close the pot with a lid and keep covered for sometime. This sambar can be served with dosa, idli, rice, chapati etc. Instead of tomatoes, you can add mixed veggies like carrots, potatoes, okra, eggplant, drumstick etc- cook along with the toor dal and follow the other steps. Make the sambar masala ahead of time and store in an air tight container.